Management direction statements (MDS) provide strategic management direction for protected areas that do not have an approved management plan. Management direction statements also describe protected area values, management issues and concerns; a management strategy focused on immediate priority objectives and strategies; and, direction statements from other planning processes. While strategies may be identified in the MDS, the completion of strategies is subject to funding and funding procedures. In addition, all management strategies are subject to Parks and Protected Areas Branch’s Impact Assessment Policy. The objective of the ecological reserve program in British Columbia is the conservation of representative and special natural ecosystems, plants and animal species, features and phenomena. Ecological reserves contribute to the maintenance of biological diversity and the protection of genetic materials. They also offer opportunities for scientific research and educational activities. In most ecological reserves, non- consumptive low-intensity uses such as nature appreciation, wildlife viewing, bird watching and photography are allowed. 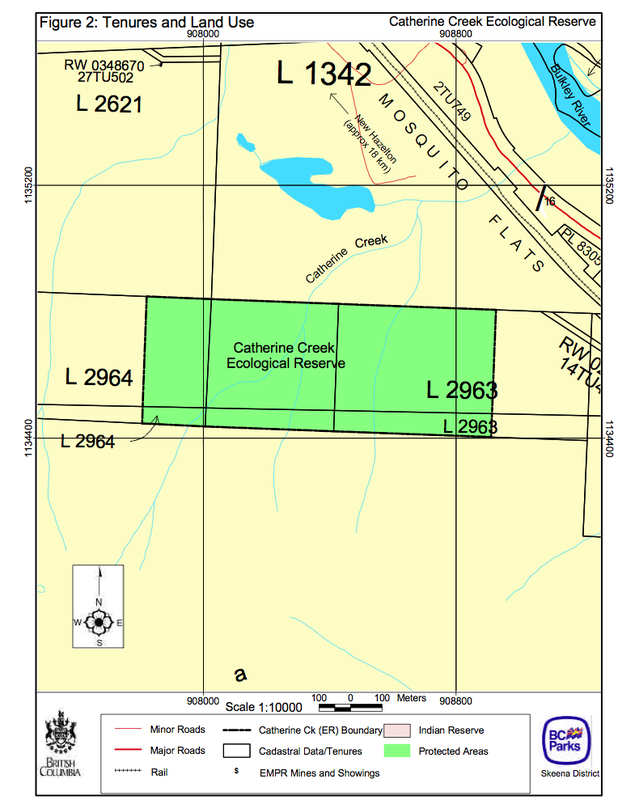 The provincial government established Catherine Creek Ecological Reserve on June 12, 2000 by the Protected Areas of British Columbia Act and it is currently listed and described in Schedule A of that Act. The Kispiox Land and Resource Management Plan (LRMP) recommended the creation of this ecological reserve. 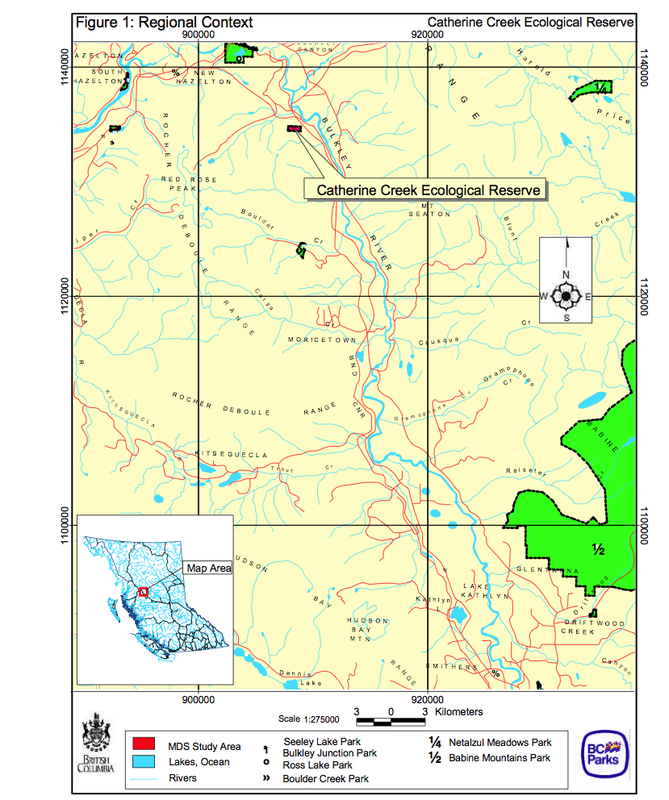 Catherine Creek Ecological Reserve is located 11 kilometres east of New Hazelton on Highway 16 near the Suskwa Forest Service Road turn-off. The ecological reserve is at 430 metres elevation and it covers 35 hectares of old-growth western redcedar with western hemlock and minor amounts of hybrid Sitka spruce, birch and aspen. The ecological reserve is within the asserted traditional territory of the Gitxsan First Nation. The outstanding feature of Catherine Creek Ecological Reserve is large diameter, old-growth western redcedar within the Hazelton variant of the Interior Cedar Hemlock moist cold subzone (ICHmc2). The ecological reserve contains a rich fern understory, with openings in seepage areas and along ephemeral streams where mountain alder, devil’s club, lady fern and herbs grow. The ecological reserve has escaped fire despite the surrounding area having a complex fire history. This type of forest ecosystem is not represented or protected elsewhere in the Kispiox Forest District. Some selective logging for cedar poles and firewood has occurred in the ecological reserve. Nearby Ross Lake Provincial Park provides day-use recreational opportunities, while Tyhee Lake Park to the east and Seeley Lake Park to the west provide camping and lakeshore recreational opportunities. Babine Mountains Park provides backcountry recreational opportunities. Protects an extremely small area of the very poorly represented Cranberry Upland Ecosection. Currently only 0.29% of this ecosection is included in the protected areas system. Catherine Creek Ecological Reserve is one of only seven small protected areas in this ecosection. Protects 45 hectares of the ICHmc2 (Interior Cedar Hemlock moist cold subzone, Hazelton variant). This variant is moderately represented in the protected areas system (4.23%). Catherine Creek Ecological Reserve contributes only 0.3% to the overall representation of the ICHmc2. 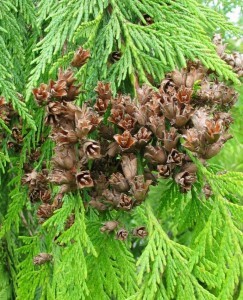 Contains large, old western redcedar trees, an unusual occurrence for this subzone. Provides opportunities to study an old-growth western redcedar forest at the limit of its range in the ICHmc2 Biogeoclimatic Zone. • Cultural values within the ecological reserve remain undocumented by the Environmental Stewardship Division. Further discussions with the Gitxsan First Nations may provide additional information. Protects an old-growth western redcedar stand. Provides research opportunities on western redcedar at the limit of its range for the area. AccessCatherine Creek Ecological Reserve is located 11 kilometres east of Hazelton on Highway 16. Highway 16 runs about 400 metres to the east of the ecological reserve but there is no road or trail access to the ecological reserve. Walking through forest is necessary to gain access to the ecological reserve. District lots L1342, L2621, L2963 and L2964 abut the ecological reserve. Canadian National Railway corridor is 300 metres to the east, and Highway 16 is 400 metres tothe east. Historical selective logging for cedar poles and firewood within and adjacent to ecologicalreserve. Ministry of Forests manages the surrounding lands for their forestry values within the KispioxTimber Supply Area (TSA).First Nations InterestsInformation provided by the Gitxsan Treaty Office indicates that Catherine Creek Ecological Reserve is within the asserted traditional territory of the Gitxsan First Nation, Djogaslee House. Chief Djogaslee has expressed his interest in visiting the ecological reserve with representatives of the Environmental Stewardship Division. This site visit will allow the Chief to determine what if any involvement the Gitxsan would like to have with the ecological reserve. The Fish and Wildlife Recreation and Allocation Branch of the Ministry of Water, Land and Air Protection has an interest in the ecological reserve especially the over-wintering moose population. Bulkley Valley Naturalists have an interest in the ecological reserve because of the old-growth western redcedar stand and its conservation. Local ecologists and naturalists have an interest in the ecological reserve to ensure protection of the old-growth western redcedar stand. Residents of Hazelton are interested in conservation of this old-growth remnant. Educational and research institutions (North West Community College, University of NorthernBritish Columbia) see the ecological reserve as a valuable scientific research and benchmark site.Ecological Reserve Role StatementCatherine Creek Ecological Reserve fulfills a conservation role within the British Columbia protected area system. The ecological reserve protects a regionally significant stand of large diameter old-growth western redcedar trees. The ecological reserve also fills a research role with the rich fern and herb understory associated with this forest, and an education role in teaching people about the dynamics of old-growth forest on a local scale. The Kispiox Land and Resource Management Plan specified that the management objective for Catherine Creek Ecological Reserve is to protect old-growth western redcedar with minor Sitka spruce inclusions and surrounding birch and aspen within the Interior Cedar Hemlock Biogeoclimatic Zone. The LRMP also directed that a management plan be prepared with the understanding that timber harvesting, mineral exploration and development are prohibited. The ecological reserve’s flora and fauna are relatively unknown because inventory of these values is incomplete. Land use activities, such as forest harvesting, on lands next to the ecological reserve may pose a risk to the ecological reserve’s ecological integrity because of possible disruption and damage to natural values. The public is unaware of the ecological reserve’s boundary as defined on the ground because no signs identifying the ecological reserve are present. Monitoring of the ecological reserve is lacking because no ecological reservewarden is designated for the ecological reserve. • The presence and s ignificance of ecological reserve’s cultural values is unkn own because inventory of these values is incomplete. Complete an inventory of flora and fauna to determine the significance of the plant communities and animal species. Work with other agencies such as Water, Land and Air Protection (Fish and Wildlife Recreation and Allocation Branch), Ministry of Sustainable Resource Management, Ministry of Forests and neighbouring land owners to ensure co- ordination between agencies and to ensure management activities do not impact on the plant communities and ecological integrity of the ecological reserve. Recruit an ecological reserve warden for the ecological reserve to conduct yearlymonitoring visits and provide site reports. Meet with the Gitxsan First Nation as issues require. Conduct a site visit with Gitxsan Chief Djogaslee and work with the Gitxsan toidentify opportunities for further discussions or studies within the ecological reserve. The Environmental Stewardship Division will consult with the Gitxsan, local stakeholders and adjacent resource users as necessary. The priority for preparing a management plan for Catherine Creek Ecological Reserve is ranked as low. This management direction statement will be reviewed and revised, if necessary, in five to seven years. ← Charlie Cole Creek ER #102 Management Direction Statement.